. . . And Anyone Can Use! The Stable-Cam has proven so successful that we've added an additional product and put together a super Delux Kit.Our family of accessories can improve your video making with just one simple connection. The Stable-Cam Model #3 - The Stable Cam Model #3 helps everyone with more professional video taping results. You can add a touch of the expert to your home videos and business videos. The new fold-away arm lets you store this camera mount in almost any camera bag. The accessory mount lets you use an off-camera mic or gives you an opportunity to use a camera. By having a side-mounted light your can better shoot head-on interviews without flattening facial features. -- $69.95, plus $10.00 Shipping, Handling, and Insurance. The Pocket-Steady - Here is handy camcorder accessory you can keep in your back pocket, your photographer's vest or even a tiny clutch purse. Inches shorter than the Stable-Cam, the Pocket-Steady is ideal for quick shots on the run when you don't want to use your swing-out monitor. This acessory folds up to less than six inches in length. 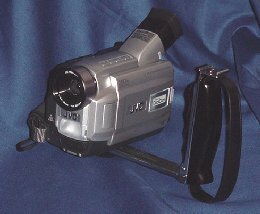 It locks open in the blink of an eye and you're ready to shoot video. -- $54.95, plus $10.00 Shipping, Handling, and Insurance. The Stable-Cam Delux Kit - The kits gives you both Model #3 AND the Pocket Steady. In addition you also get the Extend-a-Stable. 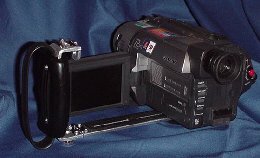 The Extend-a-Stable allows you to off-set your camcorder another four inches AND adds one more accessory mount. The kit really helps you expand your capabilities as a videographer. When you buy the Delux Kit you save over $5.00 and you get the Extend-a-Stable arm for a great video bargain. -- $118.95, plus $10.00 Shipping, Handling, and Insurance. Don't miss a shot. 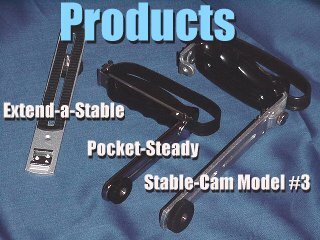 Get the Stable-Cam and enjoy viewing the results. The Stable-Cam is available for only U.S. funds only. Send company check, money order, or cashier's check to: PNW Video Productions, P.O. Box 191, Tacoma, WA 98401 or order via our shopping card.